We've been looking for these for quite sometime. 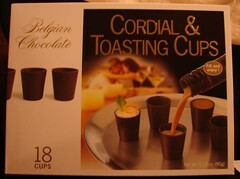 I have a bottle of Anisette (also from Ren) that we've been waiting to drink from little chocolate cups. 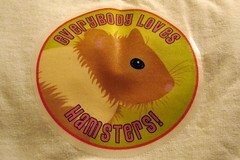 An "Everybody Loves Hamster" t-shirt! This is the design Ren created for one of the buttons we sold at Comic Con. She sort of apologized, saying she'd made it before I got the Swazzle shirt. I then went on to exclaim that, "You can never really have too many hamster t-shirts!" (which is true). Ren and her husband both laughed. I think they knew I'd say that. 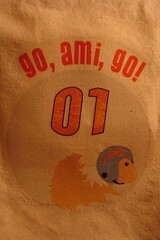 An Ami racer tote bag!!! Ren is not happy with the color and is still working on this, but I love it! As you most likely know, my hamster Ami is a champion racer. I think it's the helmet that really does it for me. I love it! Coming soon: Even more hamster gift goodness!